The Flappy Bird's sudden phenomenal success is somewhat of a riddle wrapped in an enigma. Its story is indeed full of riddles and contradictions that are hard to explain or believe. It had a sudden meteoric rise and a sudden fall. Some users love the game while others hate it; however all confess that the app is extremely addictive. Nothing similar has ever happened in the mobile market. An apparently simple game with basic retro graphics triggers storm of both positive and negative emotions. As one of the players comments: "Now I HAVE to invent a time machine. Otherwise my youth has been wasted playing Flappy Bird." Funny and said at the same time, however it's the reality. The app is said to take away all free time, ruin families, crash phones. "I’m angry, my fingers hurt, I can't sleep, I miss meals, what did you do to me flappy bird!!!" writes another desperate Flappy Bird player. Nevertheless, the situation hasn't been like this from the very beginning. The mobile game designed by Vietnam-based developer Dong Nguye and launched on the iOS App Store on May 24, 2013 was almost totally ignored by users for more than half a year. With hundreds of new apps appearing online every day, Flappy Bird was lost and no one cared about its initial release and updates. Only in November, 2013 downloads of the app slowly take place in the US. In December the download volume increases by 25 times compared to November. And already in January there is the jump of downloads — 136% increase day by day. On January, 17 Flappy Bird reaches its major milestone, becoming the number-one free app in the U.S. App Store. So, an obscure game that no one paid attention to becomes the most downloaded app on the App Store! Isn't it weird? However, the story doesn't end here. On January 24, 2014 an Android version of the app is launched on Google Play and within less than a week it becomes the most-downloaded app on Google Play. The app becomes the greatest hype ever. Its popularity continues to grow. The game goes viral. By February 1, it is topping the chart of free iOS app in 53 countries and in 4 days it is a top free iPhone app in 107 countries, top free iPad app in 109 countries, top free Google Play app in 19 countries. The app was downloaded more than 50 million times. Its developer was said to earn 50,000 USD a day. On February 6, even Apple tweeted from its official App Store Twitter account, thereby acknowledging the success of the game. Media talked non-stop about Flappymania and the mystery of the app's success. 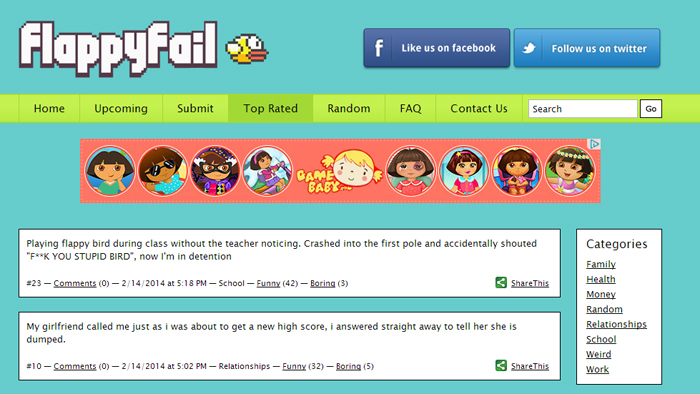 A special website FlappyFail appeared where players can share their Flappy Bird stories. The majority of reviews from the website reveal highly addictive nature of the game. Players complain that they can't control their addiction and can't resist playing the game again and again. One of the players lists Flappy Bird as one of his hobbies: "Just filled out my profile on a dating site and listed flappy bird as a hobby :)". Another one writes: "I think I met the girl of my dreams on the train today. I saw flappy bird on her cell phone when I asked for her number." However, the time to reap laurels was not too long. On February 10, Dong Nguyen removed Flappy Bird from both Apple’s App Store and Google Play because he couldn't stand feeling guilty about the addictive nature of the game. He tweeted in his Twitter account: "I am sorry 'Flappy Bird' users. 22 hours from now, I will take 'Flappy Bird' down. I cannot take this anymore." The disappearance of the game knocked users on Twitter and other social-media sites senseless. Some suggested that it was made for marketing purposes and would soon appear again but it didn't. On February 10, Flappy Bird was taken down from the App Store and Google Play. In the wake of its removal, lots of copycats and clones popped up. The game has also been distributed through unofficial channels on different platforms. 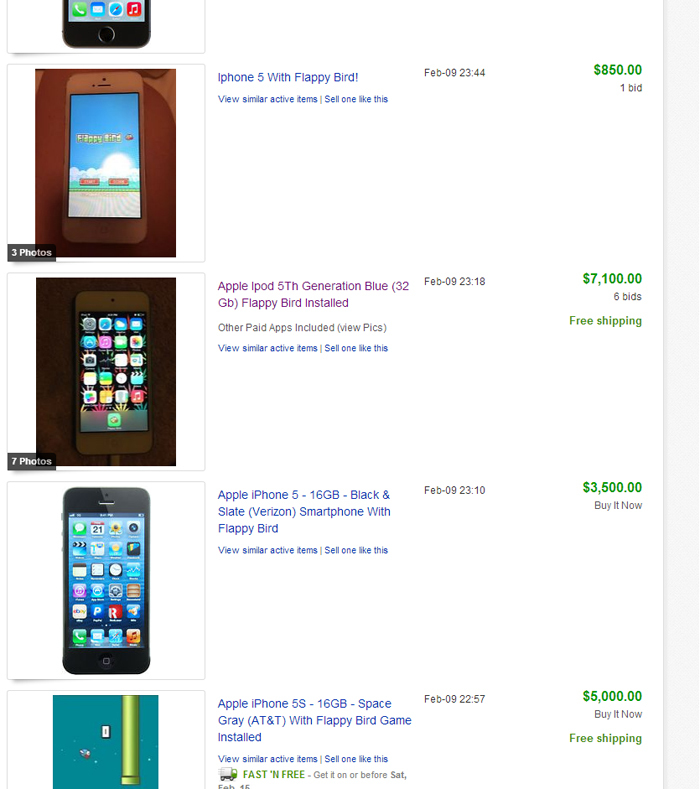 Due to the game's popularity and its sudden removal, users started selling mobile phones with the app pre-installed over the Internet. And it's noteworthy that prices for them were outrageous. In fairness it must be said that as time passed the prices got significantly lower. Now let's sum it all up and try to unveil the mystery of the game that was created in a few days, "appeared out of nowhere", was disregarded for more than half a year and then eventually became a hit in no time. At first glance, such sudden popularity may indeed look like a sheer luck or even mystery. Not surprising that Dong was accused of paying for fake reviews and buying traffic in order to manipulate ratings. Some people even said that he was using bots which generated fake reviews to help his bird fly high in app charts. Whatever the case is, there is no evidence or proof supporting such allegation. Moreover, Apple carefully controls such actions and does its best to suppress bots. Well, we would love to believe the designer's words, however it's not so easy. According to general logic, the game was not supposed to attract attention for a number of evident reasons. It has poor Mario-inspired 2D retro graphics, completely static, unchanging game play, no checkpoint or change of the scenery, questionable collision detection and it's frustratingly hard to improve scores in the game. Nevertheless, the designer managed to transform these flaws into the app's addictive features. And here we can speak about psychological reason behind the app's success. Despite the aforesaid the game exploits all necessary techniques effective for a mobile game to be popular, such as "easy to learn, but difficult to master" and incentives to replay and improve results. And above all, it's common knowledge that simplicity is the ultimate sophistication. The gameplay of Flappy Bird is very simple with no evolution throughout the game. 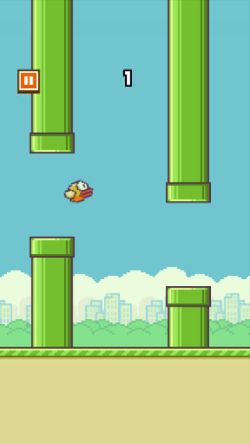 The aim is to navigate the flying bird through the green pipes without colliding with them. The bird flaps upwards when the player taps the screen, but it immediately falls down because of gravity if the screen is not tapped. The player gets scores if he passes pipes successfully (for each pipe passed successfully one point is given). If the player collides with the oncoming set of pipes the game is over. The sceneries do not change throughout the whole game and the game seems endless since there is no end to the flying track. Despite this simplicity of the gameplay, the game itself is indeed very difficult to master. And its difficulty has been a source of rage for many players. A player can spend half an hour and achieve only a score of five points, which is sure very frustrating and insanely irritating. A person compares his results with scores of other players posted over the Internet and starts thinking that his poor results are nothing compared to the results of others. And with a question in his mind: "Am I worse than others?" continues his attempts to succeed. But most likely, he doesn't improve a lot. And such irritation and frustration is really the core mechanic of the game. However, if we continue dwelling on the reasons of the success, we can't but mention another opinion on the game's popularity which apparently seems quite unrealistic. It says that intelligence agencies used the game for their investigation and information seeking purposes. The game itself is completely safe, but has some special integrated mechanisms for placing advertisements. By means of these mechanisms such bodies can collect information from players and reach their own goals. A game from an unknown designer is a perfect carrier of such information, because if something goes wrong the game and the scandal associated with it will soon be forgotten. Moreover, players themselves willingly download the app due to the word-of-mouth buzz and millions of reviews about the game over the Internet. This version is certainly very interesting, however it does look more fantastic than real. These are only some of the questions surrounding the viral mobile gaming app. It's obvious that there can't be one explanation to the phenomenon called Flappy Bird, however it seems like it was a perfect combination of circumstances, luck, word of mouth, media coverage and viral drive that worked so well together and made Flappy Bird such a hit. And the fact that the app disappeared with as much mystery as it entered makes its triumph even more spectacular.